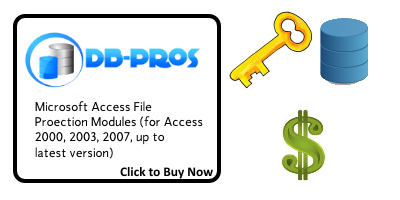 DB-Pros MS Access Database Copyright Protection, Protecting MS Access database files, Access DB File Copy Protection, MS Access Application Licensing by DB-Pros, Inc. These easy to implement Access objects allow developers to release their custom MS Access database solutions to the commercial marketplace while preserving proprietary copyright protections and preventing unlawful software piracy. *Please note a 30% re-stocking fee may be applied to returns on this product due to its source code nature.